The Opal card is the only ticketing available for Sydney public transport. It has now been implemented for all Sydney Trains and NSW TrainLink Intercity services and Sydney Ferries services. What does an Opal card do? The Opal card stores value. When you tap on at an Opal card reader it sends a signal to the reader so that you can enter the public transport network. Then, at your destination, when you tap off at an Opal card reader the correct fare is calculated. Tap on when you get on public transport. 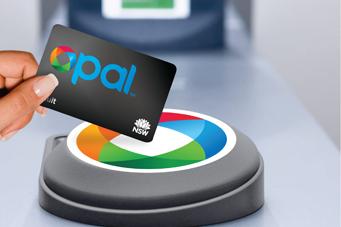 Before you board a train, bus or ferry you must tap on using your Opal card at an Opal card reader. Opal card readers are located on top of the gate at many train stations and ferry wharves. If not, use a stand-alone Opal card reader at stations or wharves to tap. Buses have Opal card readers at the front of the bus to allow customers to tap on at the beginning of the journey and at each front and rear door to tap off at the end of the journey. After tapping on, the display on the screen next to the Opal card reader and a distinctive audio tone (1 ding) will confirm that your tap on was successful.